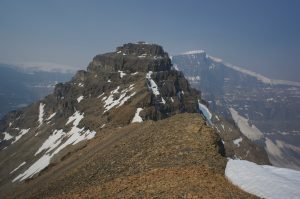 While it looks big from the highway, Mount Kitchener is really just a high point on the undulating edge of the Columbia Icefield. With only one small glacier to cross, its east ridge is the only way to reach the ice with essentially no crevasse hazard. 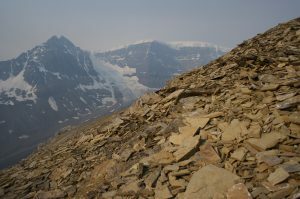 It is also fairly unpleasant, with thousands of feet of unstable talus punctuated by pucker-inducing climbing on short steps of crumbling Rockies choss, including a spiteful notch just below the icefield. With a close, high “trailhead” along the highway around 6300 feet, I thought this would be a relatively short outing — the guidebook even calls it a dayhike. While it ended up taking around 9 hours, I found it mentally taxing, made more so by the thick smoke blowing in from British Columbia. I got a late-ish start, heading out in old running shoes with my boots and socks around my neck, as the first obstacle is crossing the Sunwapta river. 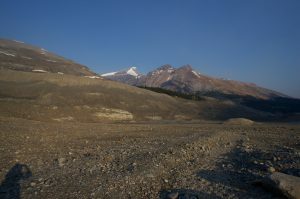 The guidebook suggests doing this right across from the toe of the ridge, but I thought the crossing looked friendlier near the Athabasca Glacier parking lot, where the braided input streams to Sunwapta Lake were no more than calf-deep. They were still bitterly cold, though, with bits of slush floating downstream in the morning, and my feet ached after each significant crossing. With that out of the way, I set my poles and running shoes on a rock, laced up my boots, and headed for the ridge. The downside of my crossing strategy is that I also had to cross the outflow from the Dome Glacier. I had hoped to find a dry crossing in the terminal boulder-field, but eventually gave up, taking off my boots to cross barefoot near the outflow of its terminal lake, again calf-deep and cold. Boots on again, it was time to begin the talus-slog. I ascended the moraine to the north, bashed through a bit of krummholtz, then turned west on the broad, rubbly ridge toward “K2,” an intermediate summit. Most of the climb to this point was on various talus, ranging from dinner-plates to unstable rubble. The smoke was already thick, and I was slow and unmotivated as I climbed toward the cliff-bands on the sub-summit. These were not as difficult as they looked, but were highly unpleasant, outward-sloping, brittle, and littered with rubble. Though there was more rubble to cross, the prospect of getting on the small glacier on Kitchener’s east ridge cheered me as I started down to the saddle. 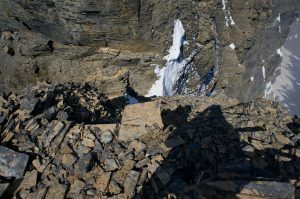 After a bit of nastiness getting across a southward fin — climbing down one crumbly chimney and up another — I found patches of decent scree-skiing to speed the descent. After regaining most of the lost elevation, I finally put on crampons for the glacier. There are two obvious cracks across the ridge, with a clear path around the left-hand side. Though it was late morning, the snow was still firm, perfect for kicking steps. Above the glacier, I soon confronted the day’s crux, a narrow and crumbly gap with a small snow-fin at the bottom. The near side was slightly outward-sloping but more solid, while the far side was incut but horribly rotten. I carefully downclimbed, cut a step to cross the snow, then sketched my way up the other side, trusting a faded hand-line clipped to a rusty piton about as much as I trusted the rubble. The book calls this “5.2,” but that is like grading a gym wall: the holds are constantly changing. From the gap, there are still a few hundred feet to gain in a gradual climb along the edge of the icefield, easily crossed in boots once past the icy edge. 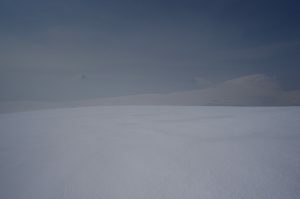 Even on a sunny, hazy day, the endless white feels a bit disorienting; it would be seriously unsettling in a whiteout. The smoke was bad: while the frequently-calving edge of Snow Dome was fairly clear, the Twins were indistinct, and Mount Columbia was a ghost. I should have stuck around to enjoy what will probably be my only time standing on the Columbia Icefield, but the sketchy notch and the long descent weighed on me. I soon headed back across the ice, with one comical slow-motion self-arrest when I slipped near the edge. The climb down into the notch was as sketchy as expected, but the climb up the other side was much easier, and I was soon booting down the glacier. The descent route drops from the saddle with K2 to the rubble-covered Dome Glacier. This would have been wretched talus later in the season, but fortunately there were several snowfields with a perfect surface and angle for boot-skiing. I wish the light had been better, because the Dome Glacier is magnificent, with two large branches falling from the icefield above to feed a long tongue in the valley. I hiked endless, unstable rubble on its surface, then crossed its toe to reach the north side of the terminal lake. The outflow stream was noticeably larger than when I had crossed it in the morning, boding ill for my return ford. I could have avoided that by going up to the toe of the Athabasca Glacier, but I had the shoes and poles in place, and walking outside the rope line would probably anger a ranger. Gritting my teeth, I made my way back across the channels — knee-deep this time — then put my boots on to warm my feet on the short walk back to the car. Along with the usual assortment of tourists in rented RVs, I was surprised to see a car with the New Mexico vanity plate “PKFREAK.” I should know this person.